It is easy to think that poverty is an LIC (Low Income Country) problem and that shanty towns only occur in LIC cities. The reality is that even within so-called wealthy countries there is poverty and that many HIC (High Income Country) cities have their areas of poor housing, often self-constructed. HIC cities also contain people who are living and sleeping on the streets. Calculating the index is quite complicated, but once it is done all the local authorities can be compared. From this comparison, it is possible to identify both the most deprived areas and the best areas. 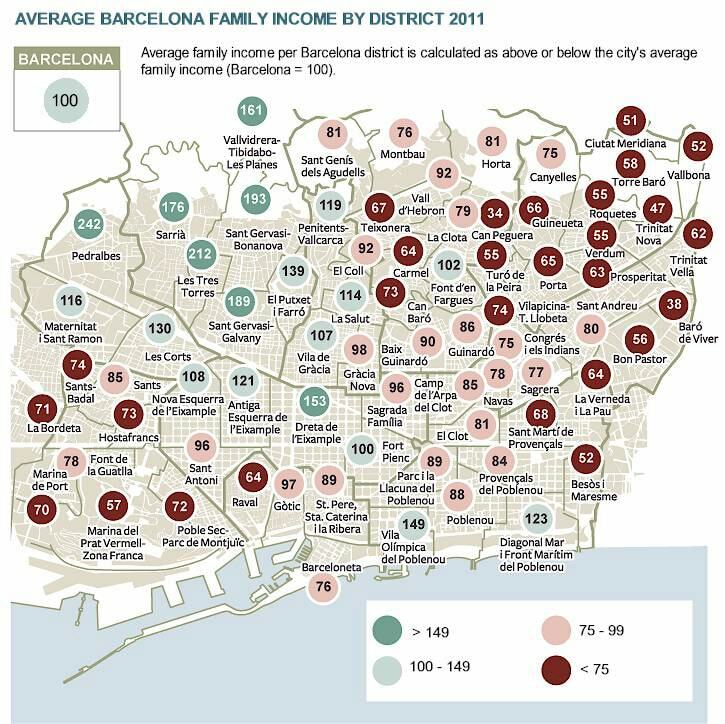 The diagram below shows the average family income (2011) by district in Barcelona – a key indicator of deprivation in the city. • towards the city’s edge - here deprivation mainly occurs in the estates of social housing built by the city to house large numbers of migrants from other parts of Spain (such as Andalucia) who moved to Barcelona looking for work in the 1960s. 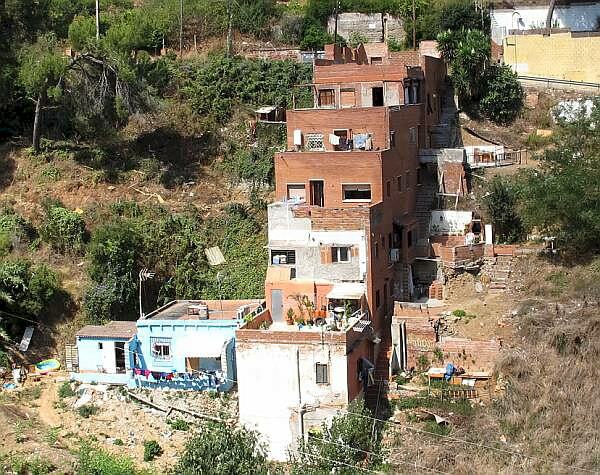 Can Peguera, the poorest district of all, is also known as the "casas baratas" district, and is where the immigrant workers who built the 1929 exhibition initially stayed. The areas with least deprivation are the districts where wealthier people live, concentrated in the northwest of Barcelona and in a new belt lying along the north east coastline. What are the symptoms of deprivation and poverty? Perhaps the most obvious are the physical signs of poor housing (slums) and an unattractive living environment (noise, unsightliness, graffiti, etc.). Services provided in these areas, such as schools, medical centres, sports facilities, parks and shops, are often of a poor quality. The people who live in these areas of poor housing also feature characteristics that are part of the symptoms of deprivation. In general, there is a relatively high incidence of unemployment and single-parent families. Many of those of working age are able only to take on unskilled, manual work. Many have received only a minimal education. There is also a relatively high incidence of crime and what are called domestic disputes (conflict between partners), anti-social behaviour, etc..
What is also noteworthy is the pattern of distribution of Barcelona’s ethnic minorities (below), and its relationship with low average family income. In studying the occurrence of deprivation, we need to be aware of what is called the cycle of poverty (see diagram below). This is based on the idea that poverty and deprivation are passed on from one generation to the next. The children of poor parents often receive little parental support with children from high-income families being exposed to 30 million more words by age 3 than children from families on welfare. Follow-up studies showed that these differences in language and interaction experiences have lasting effects on a child’s performance later in life. Children from low income families attend less adequate schools and do less well, leaving school at the earliest possible opportunity with few qualifications. This, in turn, means that they have difficulties finding work and can therefore only expect to earn low wages. The children they have are born into the same environment of deprivation. Thus families tend to remain 'trapped’ in a cycle of poverty, being unable to improve their circumstances. The challenge to societies around the world is how to make it possible for people to break out of this cycle of poverty. A person living in Pedralbes, in the north west of Barcelona, has an average of eight more years of life expectancy than a person living in el Raval (with a family income of 64.2), 81 years versus 73. This was revealed in the October 2012 European research project (SOPHIE) on the impact of public decisions on health in Barcelona.